Maseru is the capital of Lesotho as well as its largest city. Maseru, a Sesotho word, means “place of the sandstone.” The city is situated along the west central border between Lesotho and South Africa on the Calderon River. The 2006 census showed its population as approximately 227,880. The city of Maseru was officially founded in 1869 following the Free State-Basotho Wars between the Boers and the British. Maseru was originally established as a small police camp by the British. Between 1871 and 1884, Lesotho was governed from the Cape Colony (present-day South Africa) and remained the administrative capital after Basutoland (current-day Lesotho) became a British colony in 1884. The small settlement survived being burned down during the Gun War of 1880-1881 between British forces and Basotho political leaders over the right of indigenous people to bear arms. The Basotho people won the conflict. At the beginning of the twentieth century, Maseru was a small settlement that consisted of a small number of colonial administrative buildings, a trading store, and several outlying villages. It later grew into a busy market town. A Chamber of Commerce was formed in 1890 and two newspapers, Mochochonono (“The Comet”) and Basutoland News, were founded in 1911 and 1927, respectively. By 1933 the town had streetlights and an improved water-supply system was built in 1949. In addition, the class structure of this colonial capital became more complex. It now included British colonial officials, European traders and professionals, African professionals, both black and white clerks and interpreters, and a small service class of domestic workers and shop assistants. Tensions remained high across these classes and divisions under British colonial rule partly because the racial hierarchy was maintained through a variety of laws such as residential segregation. During the early to mid-1950s, the country of Lesotho began to make progress toward independence. In 1952 the Basutoland African Congress was formalized as a Pan-Africanist and left-wing political party. It was renamed the Basutoland Congress Party in 1957. In 1961, the African population came together to protest unfair labor practices, discriminatory legislation and social practices, and other elements of the colonial regime. In 1963, neighboring South Africa imposed documentation laws that required Lesotho citizens to provide travel documentation in crossing the Lesotho-South African border. These developments, along with the ongoing colonial rule in the country, gave rise to calls for national independence. Lesotho gained its independence in 1966 and Maseru became the capital. Following independence, the population began to increase steadily as people moved throughout the country and into the city in search for wage labor. 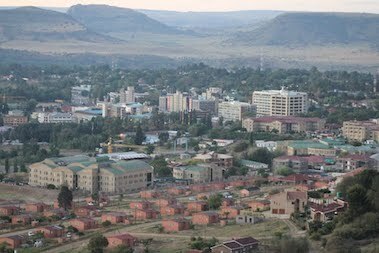 Maseru is the only major urban center of Lesotho and its population increased from approximately 20,000 in in 1966 to over 200,000 by the end of the twentieth century. Maseru’s population accounts for nearly 10% of the total population of Lesotho. Today, approximately 80% of the city’s population is Christian and 20% practice indigenous beliefs. Anthony Appiah and Henry Louis Gates, Africana: The Encyclopedia of the African and African American Experience (New York: Basic Civitas Books, 1999); Paul Tiyambe Zeleza and Dickson Eyoh, Encyclopedia of Twentieth-Century African History (London, UK: Routledge, 2002). Twentieth-Century African History (London, UK: Routledge, 2002).